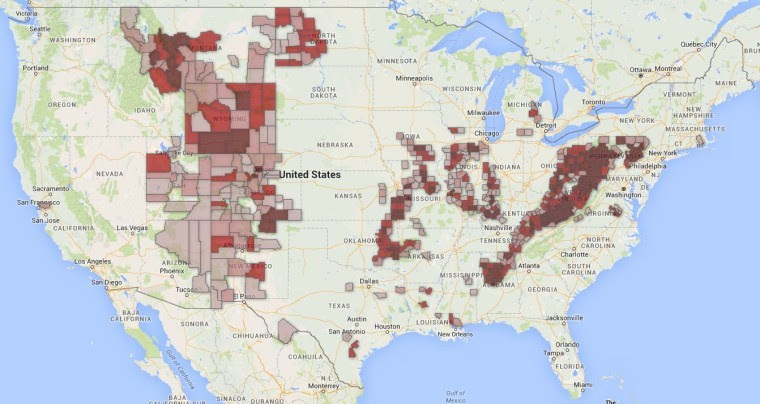 The darker the red, the greater the extend of remaining abandoned mines. Image: The Daily Yonder. The RECLAIM Act is going to a vote before the House Natural Resources Committee TOMORROW. Despite having shown no interest in the legislation over past the past two years, corporate coal interests have launched an all-out assault to kill the billÂ in the past few days. We canâ€™t let corporate interests steal this opportunity from folks trying to build a bright future for their home. The RECLAIM Act would create thousands of jobs in communities struggling with the decline of the coal industry. RECLAIM is sponsored by Congressman Hal Rogers (R-KY) and a bipartisan set of cosponsors. The legislation would use $1 billion sitting idle in Washington to put people to work cleaning up abandoned coal mines. It could also spur the reuse of reclaimed mines for development projects that would diversify local economies, like this agriculture project in West Virginia. But the current bill language needs to be strengthened in order to catalyze economic projects like these. Representative Don Beyer will offer an amendment on Tuesday to strengthen the bill. RECLAIM would be funded through a $2.5 billion federal fund that has been financed by the coal industry over the past 40 years. The RECLAIMAct doesnâ€™t use a cent of taxpayer money. It imposes no new fees or taxes, and has no impact on the coal industry. The RECLAIM Act uses existing funds to create jobs and clean up dangerous mines. It’s a win-win-win. We know it. You know it. Now it’s time to let Congress know it, too. Before it’s too late, call and show your support!